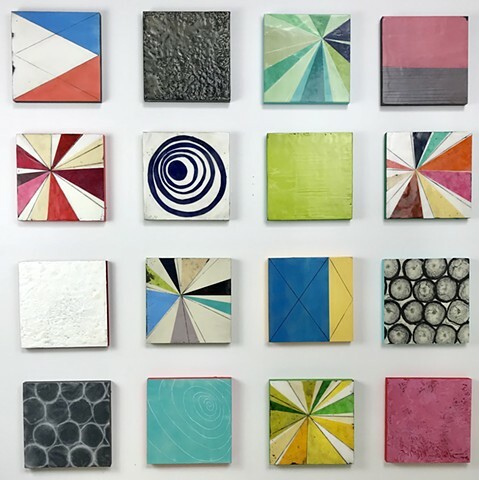 There are a variety of techniques used in this series, some have collage elements, others are colored encaustic. For the collage pieces, each shape is hand cut from natural fiber papers and then suspended between layers of clear encaustic medium to create a thick translucent surface which draws the viewer into the piece. In areas where the wax application is thickest there is a subtle golden depth to the wax. I use a torch to manipulate and fuse the wax this gives my surfaces a beautifully textured finish. Encaustic (bees wax & damar resin), ink, paper, gesso and oil on cradled wood panel. Signed, dated and titled on the back. There are lots of yummy wax drips on the sides which are all painted differently, this installation is ready to hang!